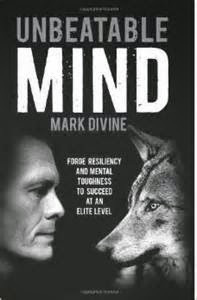 "Unbeatable Mind" by Mark Divine was loaned to me and I started reading it today. Normally when I read it's for enjoyment. I still plan on incorporating some books to read just for fun, like Stephen King's "Under The Dome", that I bought about 6 months ago and have yet to even open it. But, one of my goals is to start reading daily something that will help me improve myself. As I read these self-improvement books, part of the process is journaling what I get out of them. I plan on sharing my thoughts as I go through each chapter. Today I completed the introduction, and just in that alone I can already tell this book is going to be a good guide. As I have recently posted about physical, mental, emotional, and spiritual health; in this book Divine will talk about how to use your mind to rise yourself to what he calls the "fifth plateau consciousness". He states you do this by integrating your five key lines of human development, which he calls the "five mountains". Those five mountains are your physical, emotional, mental, spiritual, and intuitional intelligences. I want to end this post by sharing some of the things I got just out of the introduction that really made me take note and think. "Your passion is to be a leader, a warrior, and to find a grand adventure. Your principles are being compromised by chasing money, and your purpose is bigger than just being in business for the sake of a career." - This was something his inner voice told him as he went through Zen and warrior training. "If we can control stress and fear, we can focus and lead much better." - What he learned in SEAL training and in business. "I encourage you to enjoy the journey rather than focus on the destination. For every mountain you climb and plateau you rest at, there will be another and more interesting view ahead." - This is just great advice, and a great reminder we need to enjoy life as we live it.